By this morning, things had cooled somewhat, both in and out. 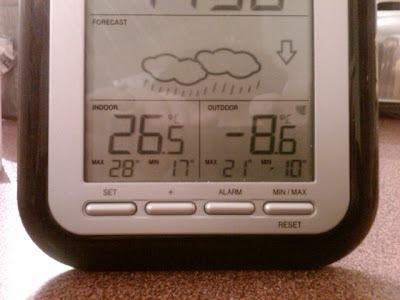 The indoor fell overnight by almost 3 degrees, while outdoors it went from -9 to -12. I could have kept the indoor from falling, but by doing so, I might have had to light the fire again. So far, this was the coldest night of the season. I hope that the thermometer sensor is located inside the wood stove!!! Otherwise, I hope your freaking RICH, AND your completely don't care what happens to our poor planet. Remember, heat loss is proportional the the temperature DIFFERENTIAL (see http://en.wikipedia.org/wiki/Heat_transfer). I do know a few nut cases that actually keep their houses like that in the winter but I'm pretty surprised that your one of them. A temperature of 18 degrees is fully adequate (I would go lower). Remember, there is such a thing as a sweater. Otherwise, consider moving to Florida. Oh this is rich ! You expect the inside of a wood-stove to accommodate a plastic thermometer? Then you lecture me about heat loss, call me a nut case, enlighten me about these things called sweaters, then advise me to move to Florida. Anything else you'd like to add there Gregory Claus ?? No lectures from me, but I am curious why you would need a temperature of 26 + in your home. 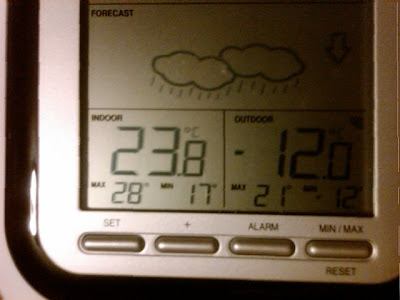 21 in the days seems about right for us, 17 or so at night, though it does get down to 13 some nights depending on outdoor temperatures. I can see this is going to be a case of a picture costing a thousand words instead of worth a thousand words :) 26c is somewhat arbitrary in that it is at one location in the house at one particular time. This is the scourge of heating with a wood stove, especially when the stove is in the basement and the house was not designed or laid out to be effectively heated in this manner. Wood stove heat is difficult to regulate and difficult to distribute. It's not like I have a thermostat set at 26c. For example, go to a bedroom far from the stove, and it might be 18c. Go down in the rec-room and stand 3 feet from the stove, and it might be 36c. So, no, I don't "need" 26c, but I often have to accept it if I have the stove lit. Hey Tom, I was joking about the thermometer being in the stove. But seriously, 26 is really, really hot. Are you sure the thermometer is working? Also seriously having poor air circulation is one reason why you may need to to heat that much. But you may want to consider trying to solve that problem (you may have tried to already). Small fans, ceiling fans, or something might help save you a ton of cash. Finally, there is defiantly a huge environmental impact from burning wood. It's not really a very "green" (puke) technology. The fact that it's renewable, is really only one aspect. In my world, 26 is not "really, really hot", but your comments are valid. Circulation is the smaller of the two problems. "Regulation" is a bigger issue in that the stove must either be lit, or not lit. If it's lit, then you can only "slow it down" to a certain extent". I only have two methods to regulate the thing, one is limiting the fuel, and the other is limiting the air. Limiting the air too much tends to cause a dangerous buildup of creosote. Yes, I use fans, and they do help somewhat. So that explains my question, can relate as for 14 years our only source of heat was from wood stove. Fortunately the stove was located at one end of the house directly facing the hall way that led to the bedrooms. Hall way acted like a funnel. If I had a full basement we would still have a wood stove for those real chilly nights. Our grandaughter is in YHZ due to leave before noon, hope that storm front holds off. You'd be the first peson I'd call. What did you get ? Linux in a Windows world ?